At Mazda, we love sharing the beautiful machines we craft with the world. But even more, we love building relationships with the people who drive away in them. Learn more about the passionate Mazda owners who won our contest. After an incredible experience with her previous Mazda, Wendy became a loyal Mazda owner and purchased a new 2018 CX-5 GT. 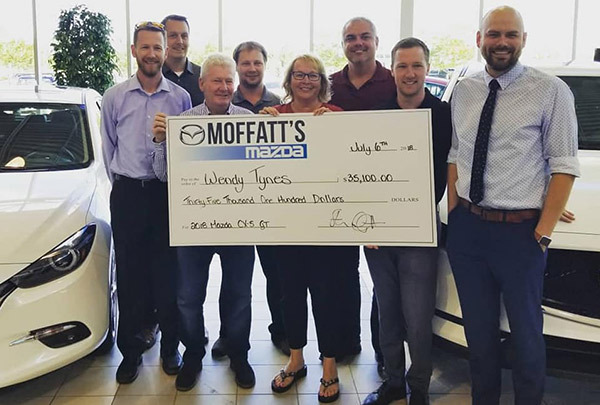 Over the years, Wendy’s family has purchased four Mazdas and built a lasting bond with their local Clubhouse of Driving Passion, Moffatt’s Mazda. The Win Your Mazda contest has been life changing for Wendy. She is ready to hit the road this summer with her passion for driving and some new-found financial freedom. Congratulations, Wendy! Katey’s experience with Mazda is a testament to the importance and impact of our Mazda Test Drive Experience. Convinced she would be purchasing a competing brand, Katey got behind the wheel of a Mazda. The connection was immediate. 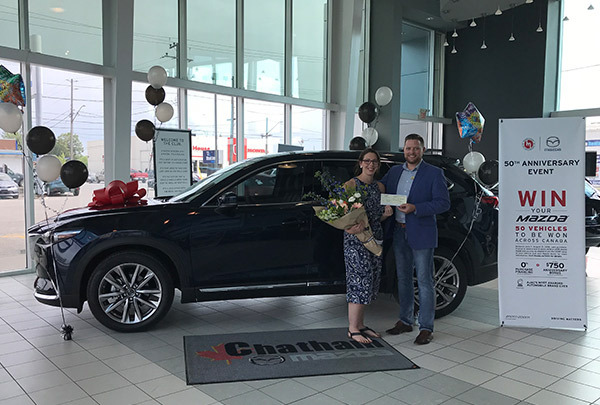 Katey fell in love with the luxurious features of the CX-9 GT and her dealership experience at Chatham Mazda. 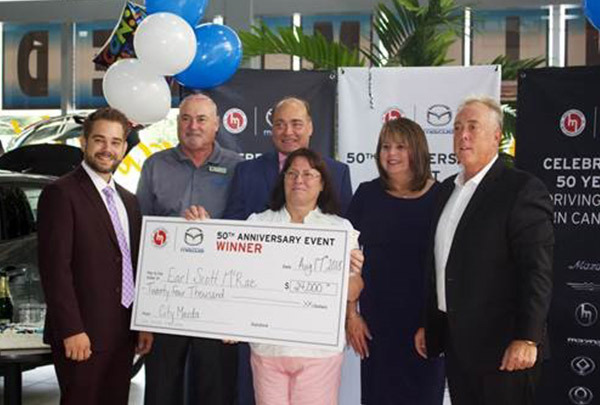 To her surprise, Katey won the full MSRP value of her vehicle during Mazda’s 50th Anniversary “Win Your Mazda” contest and plans on hitting the road with a fully paid-off vehicle this summer. Congratulations, Katey! Pascal is still completely awestruck after being awarded the full MSRP value of the Mazda vehicle he had just purchased. As a fan of Mazda’s KODO "Soul of Motion" design language, Pascal had made the decision to upgrade from a CX-5 to a CX-9 GT. 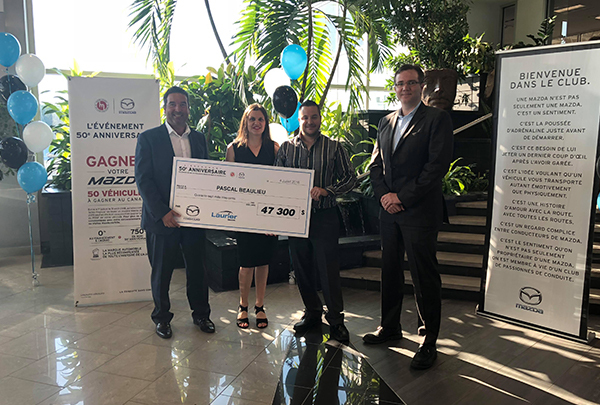 Laurier Mazda welcomed Pascal and provided him with an outstanding Clubhouse of Driving Passion dealership experience. Pascal plans on hitting the road this summer with a fully paid-off vehicle and his shared passion for driving. What a great feeling! Congratulations, Pascal! Zhian’s experience is a testament to the incredible craftsmanship of Mazda’s engineers and designers. Zhian had done a lot of comparison shopping and when he learned about Mazda’s SKYACTIV TECHNOLOGY and full suite of safety technologies, he was immediately drawn to the Mazda brand. As a loyal customer with a CX-3 and after having had an outstanding Clubhouse of Driving Passion dealership experience at Markham Mazda, Zhian upgraded to a 2018 CX-5 GS. Markham Mazda made Zhian feel comfortable and at ease within the dealership by communicating with and presenting the vehicle to him in his native language. Something that was very much appreciated by him. 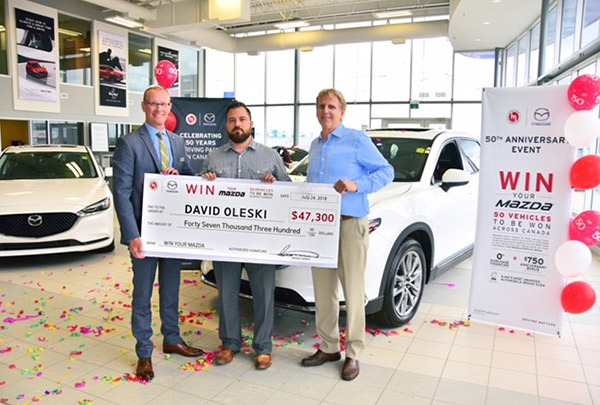 To his surprise, he was selected as a winner in Mazda’s 50th Anniversary “Win Your Mazda” contest! 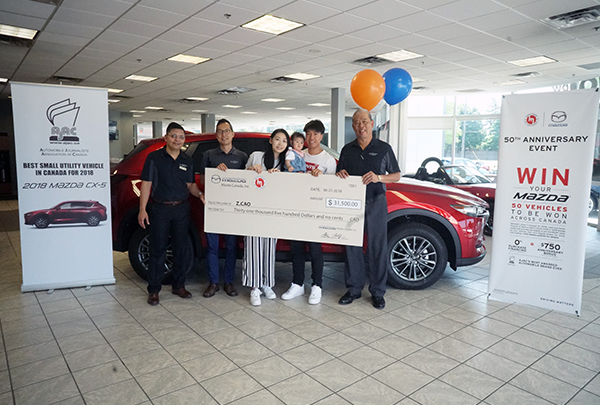 After having received a cheque for the full MSRP value of his vehicle, Zhian plans on purchasing a well-deserved wedding ring for his wife and is looking forward to enjoying time with his growing family on the open road in his new Mazda this summer. Congratulations Zhian! Nothing makes us prouder than to welcome a new Mazda owner to the Clubhouse of Driving Passion. And what an incredible welcome Nicole has received from Mazda Canada and Pacific Mazda! After having test-driven multiple brands, Nicole was very impressed with Mazda’s test drive experience and felt that the MAZDA3 offered the best features and finishes above all the competitors she had test-driven. She immediately felt at ease, comfortable and never felt pressured, which is a testament to the Clubhouse of Driving Passion experience at Mazda. Nicole is a recent student who has just completed her dental hygiene program. 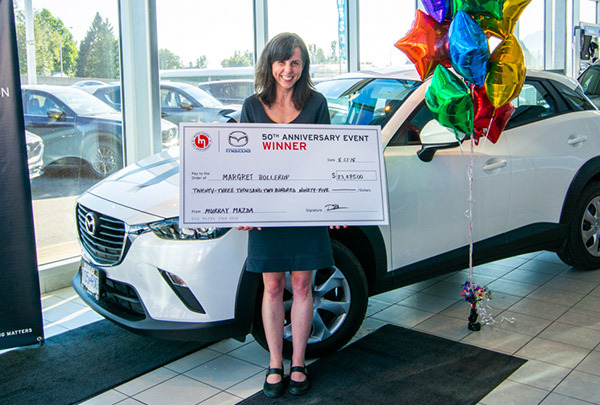 She is beyond grateful for having won Mazda’s 50th Anniversary “Win Your Mazda” contest and plans on paying off her student loans! Nicole is ready to hit the road this summer in her new 2018 MAZDA3 Sport 50th Anniversary Limited Edition and some newfound financial freedom. Congratulations Nicole, and welcome to the Clubhouse of Driving Passion! After having had an incredible dealership and test drive experience at GO Mazda and having loved her previous CX-5, Patricia’s decision to re-purchase a CX-5 was an easy one. Patricia never felt pressured. In fact, she was invited to take the vehicle out for a drive to experience the features for herself. The GO Mazda staff was certain that the vehicle and its features would speak for themselves. And they did! Patricia is the proud new owner of her brand new 2018 CX-5 GS and a loyal Mazda customer! Patricia can’t wait to hit the road this summer with some new-found financial freedom, with plans to pay her vehicle off in full! Mazda Canada is thrilled to have you on board as a member of the Clubhouse of Driving Passion, Patricia. Congratulations! New to the Mazda brand, Marlene researched various competitors when looking for a new vehicle and found that Mazda offered the most value and features based on her needs. Marlene experienced exceptional customer service at her local Clubhouse of Driving Passion, Mazda Chatel, and in the end, she was very confident in her decision to purchase a CX-5. 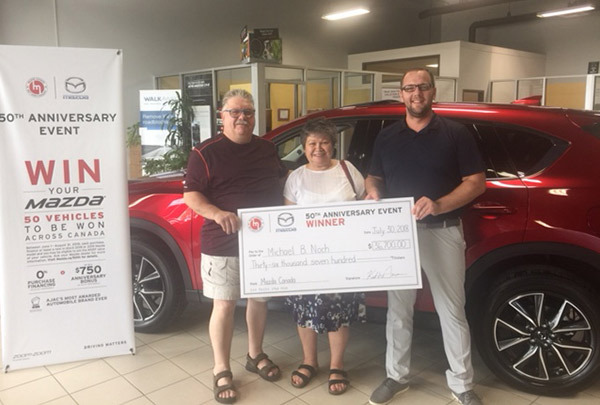 Marlene’s partner is in the market for a new vehicle and plans on purchasing another Mazda with the money she has won from our 50th Anniversary “Win Your Mazda” Contest. Congratulations and welcome to the Clubhouse of Driving Passion, Marlene! 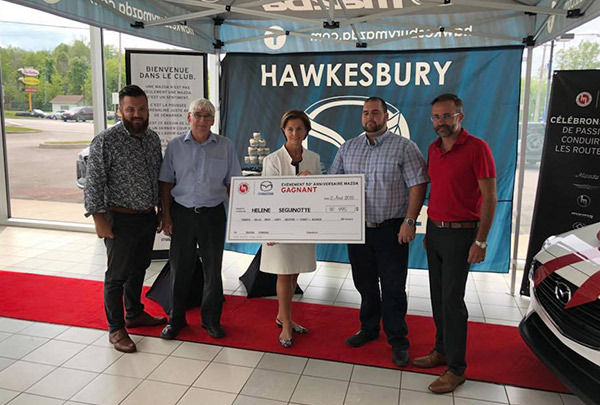 As a loyal Mazda Ambassador and true believer in the passion behind the brand, Helene loves the features and design of Mazda vehicles and has always had a wonderful sales and service experience at her local Clubhouse of Driving Passion, Hawkesbury Mazda. She plans on being a Mazda customer for life! Congratulations, Helene, and thank you for your years of loyalty and passion. This is what the Clubhouse of Driving Passion is all about and we’re happy to have you on board! David was in the market for a new vehicle and had tested several competitors prior to making his decision. After having had an incredible test drive experience at Mazda, David looked no further. He purchased a CX-9 GT based on having had the smoothest drive in comparison to all of the other vehicles he had driven. David loved that it was the most fuel efficient, luxurious and stylish and could not have asked for a better experience at his local Clubhouse of Driving Passion, Gerry Gordon’s Mazda. David plans on using the $47,300 he has won to pay off his vehicle and to treat himself to some new furniture as he will be moving in a few weeks. Congratulations, David. Welcome to the Clubhouse of Driving Passion! Caroline was thrilled to have been selected as a winner for Mazda’s 50th Anniversary “Win Your Mazda” Contest. This is her 4th Mazda but her first new car! 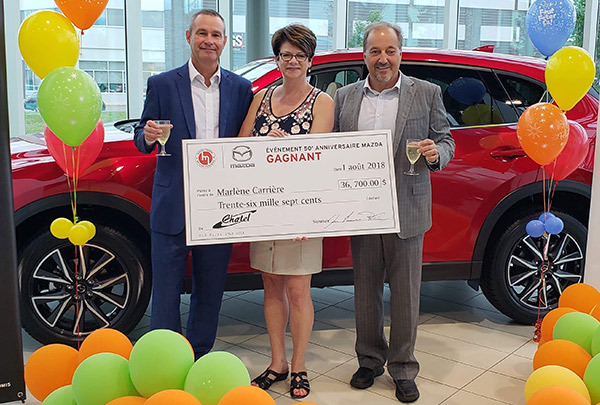 After having had an incredible experience at her local Clubhouse of Driving Passion, Albi le Geant Mazda, Caroline truly appreciated the time they took to go through all of the best options for her, based on her needs. Caroline is loving her new CX-3 and is a true fan of the Mazda brand. After having had a great experience as a previous Mazda owner, Alexander wanted to stick with what he loved about the Mazda brand and decided to purchase a 2018 50th Anniversary Edition MAZDA3. The experience he received at his local Clubhouse of Driving Passion, Bay Mazda, was further proof of why he made the decision to purchase another Mazda. The dealership was incredibly helpful and provided him with excellent service. 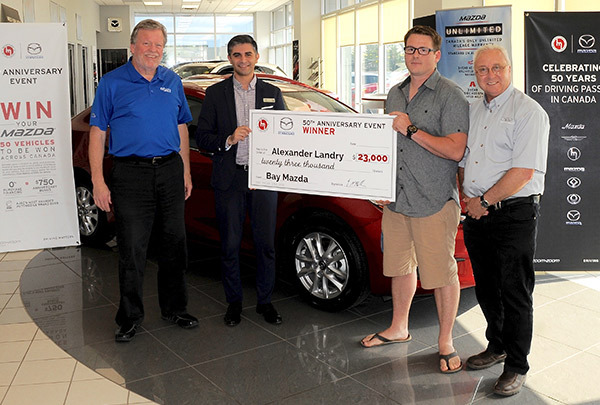 Congratulations on winning your Mazda, Alexander! Phoebe is a true fan of the Mazda brand. As owners of a MAZDA3 and CX-5, Phoebe’s family loves the responsive driving dynamics and how a Mazda feels from behind the wheel. Phoebe plans on purchasing a third Mazda as they recently had to write off their third vehicle due to an accident. 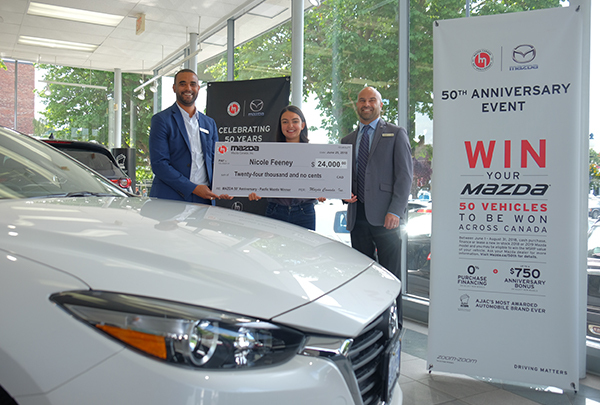 After having test driven another MAZDA3 recently, Phoebe would love to use the money she has won in Mazda’s 50th Anniversary “Win Your Mazda” Contest to purchase a new MAZDA3. Reputation can go a long way, and when Michael had heard multiple positive reviews about the Mazda brand through various sources, he decided to test drive a CX-5. He was immediately impressed with what the vehicle had to offer and how the drive in a CX-5 felt. Michael had a great experience with his local Clubhouse of Driving Passion, Forman Mazda, and felt that everyone at the dealership was very helpful in assisting him with his purchase. Congratulations, Michael. Enjoy your new 2018 CX-5 GT! Charles is someone who understands the passion that goes into every Mazda after having owned an MX-5. He has always been impressed with the quality, features, craftsmanship and driving dynamics and has nothing but wonderful things to say about his local Clubhouse of Driving Passion, Markham Mazda. 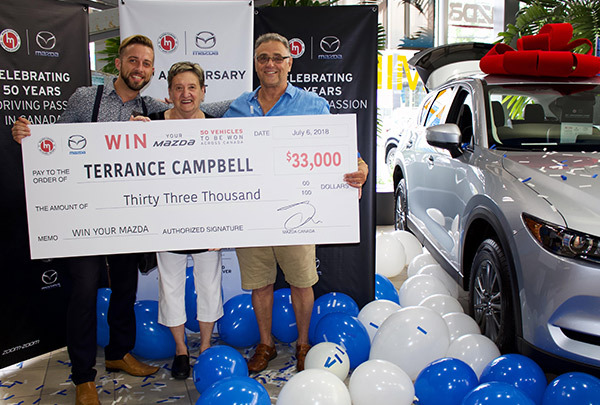 Charles is thrilled that he was selected as a winner in Mazda’s 50th Anniversary “Win Your Mazda” Contest and when asked what he would do with the money he has won, he said he would spend a lot of time thinking about it as there are so many possibilities! Congratulations, Charles! After having owned two Mazda vehicles previously and as a loyal fan of the brand, Julie’s decision to purchase another Mazda was an easy one. Julie’s brand-new 2018 MAZDA3 Sport GT is fully equipped with all the features she was looking for. Her experience at Mazda Chatel went beyond her expectations – their knowledge and confidence in the Mazda brand made her feel like she truly was a member of the Clubhouse of Driving Passion. 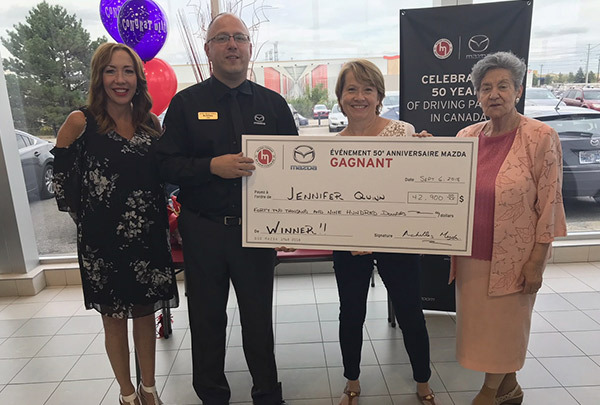 Julie is so thrilled to have won the Win Your Mazda contest that she is considering purchasing an MX-5 as a summer vehicle. We couldn’t agree more, Julie. Congratulations! When you’re surrounded by beautiful mountains in Chilliwack, BC, having a reliable vehicle with AWD is paramount to getting you to your destination safely. Margret was new to the Mazda brand. After having done plenty of research and speaking with friends, she chose to visit a Mazda dealership. 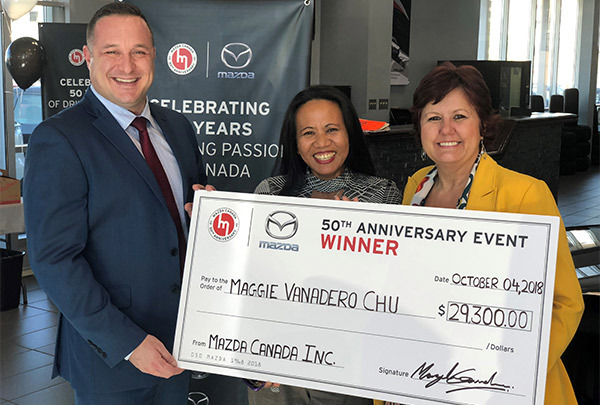 From the moment Margret stepped into Murray Mazda, Chilliwack’s Clubhouse of Driving Passion, she knew she had found her new vehicle. Margret was met with knowledgeable and friendly staff who really took the time to listen to her vehicle needs. 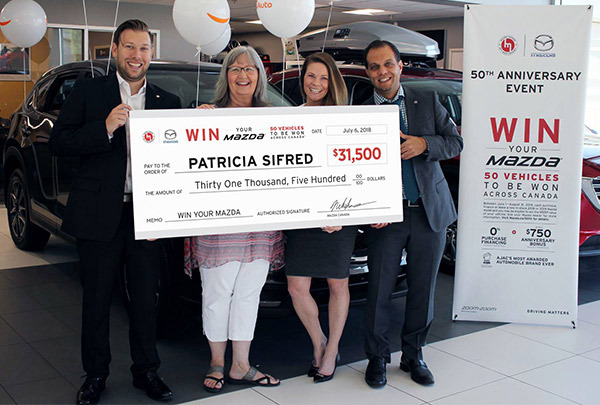 When asked what she would do with the money she has won, Margret mentioned that the first thing she would do is upgrade her vehicle with Mazda’s navigation system. Welcome to the Clubhouse of Driving Passion, Margret! There is nothing we love more, as a brand, than to see our fans share the passion they have for their Mazda vehicles with friends and family. 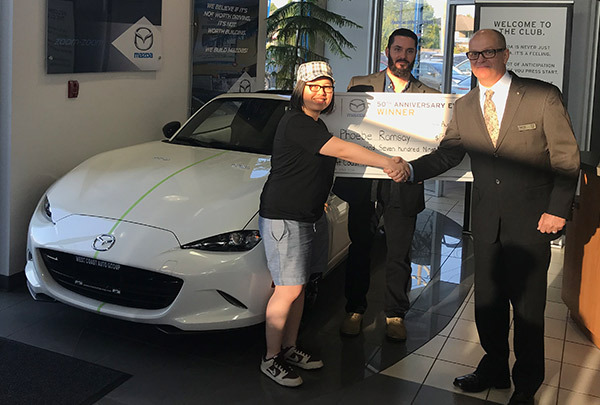 Daisy purchased her first Mazda in July 2018 and has since convinced two family members to join Mazda’s Clubhouse of Driving Passion. From the moment Daisy set foot inside Maison Mazda and took a test drive in the new CX-3, she knew it was a perfect match for her. Daisy plans on paying off a portion of her new vehicle and using the rest towards the balance of her student loan. Welcome to the Clubhouse of Driving Passion, Daisy and family! After having done extensive research on several vehicle brands, comparing warranties and customer reviews, Gregory decided that Mazda was the best choice for him. 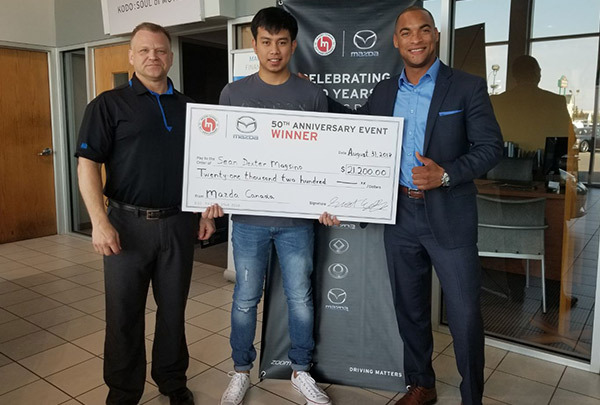 The connection he felt with his local Clubhouse of Driving Passion, Kingston Mazda, went beyond his expectations. Gregory was drawn to Mazda’s beautiful vehicle designs, along with the Unlimited Mileage Warranty and the staff, who made him feel right at home. 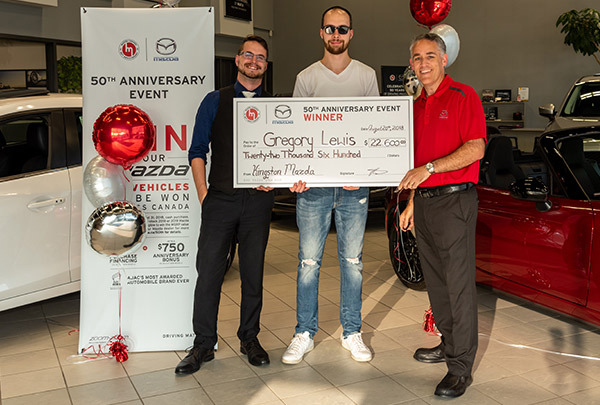 Gregory hopes to either pay off his new vehicle or do some travelling with the money he has won from Mazda. When it was time for Earl to purchase a new Mazda, he returned to his local Clubhouse of Driving Passion, City Mazda. Earl was very impressed with the comfort and driver-centric interior along with the Active Driving Display and superior sound insulation. SKYACTIV TECHNOLOGY, however, is what blew Earl away. With fuel economy and better torque than others in its class, while still providing a smooth ride, Earl knew that the MAZDA3 50th Anniversary Limited Edition was the vehicle for him. Earl plans to invest the $24,000 he has won into an RRSP. Sometimes, the best research comes from riding along with your friends in their vehicles! 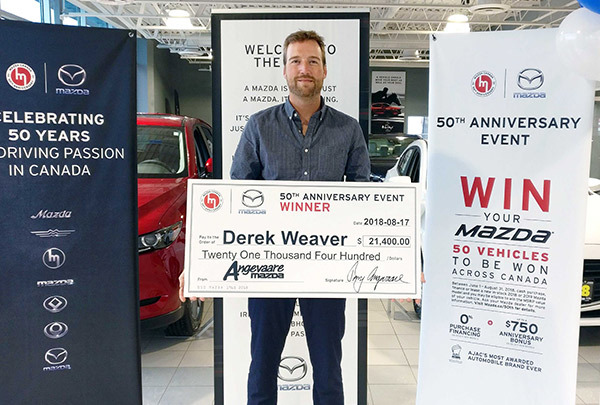 After years of being a passenger in several Mazdas and enjoying the premium high-end features, Derek visited his local Clubhouse of Driving Passion, Angevaare Mazda, when he was ready to purchase a new vehicle. Impressed by the premium features, such as Bose® speakers and the MAZDA CONNECT system, the vehicle’s longevity and fuel efficiency was ultimately the biggest contributor to him choosing the 2018 MAZDA3 Sport GS. With an exemplary experience both behind the wheel and at Angevaare Mazda, Derek knew that Mazda was the right choice for him. Derek hopes to pay off part of his new vehicle and put some of the money towards his home. Congratulations Derek! You’ll be the envy of all of your friends as you drive around in your brand-new MAZDA3 Sport! This is Sharona’s first vehicle in Canada. Originally from New Zealand, Sharona moved to Canada in 2016. From start to finish, Sharona was very impressed with the Mazda brand and her dealership experience. She felt safe and comfortable at her local Clubhouse of Driving Passion, Destination Mazda Vancouver. The team was very attentive to her needs and took the time to listen. Sharona purchased a 2018 Mazda CX-5 with AWD and couldn’t be happier. 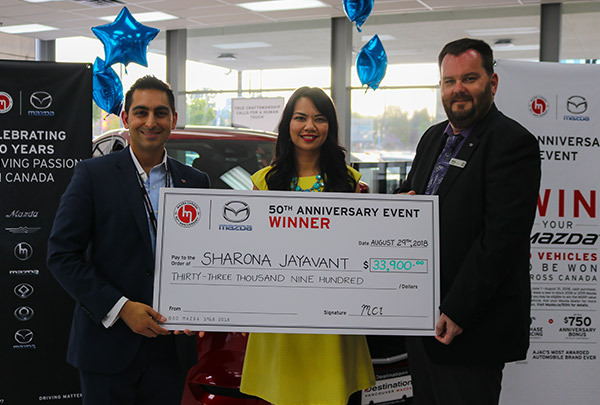 The money that Sharona has won with Mazda’s Win Your Mazda Contest will be a huge help as she begins a new & exciting chapter in her life. Mr. Boutin did not need to be convinced that Mazda was the brand for him when purchasing his next vehicle. After having owned a CX-3 and speaking with his step-brother who is a mechanic and a fan of Mazda engineering, Mr. Boutin decided it was time for a bigger Mazda vehicle. He looked no further than the CX-5. Mr. Boutin is very impressed with Mazda’s reliability, fuel economy and comfort. Most of all, he feels that Mazda vehicles drive and handle perfectly on the road. 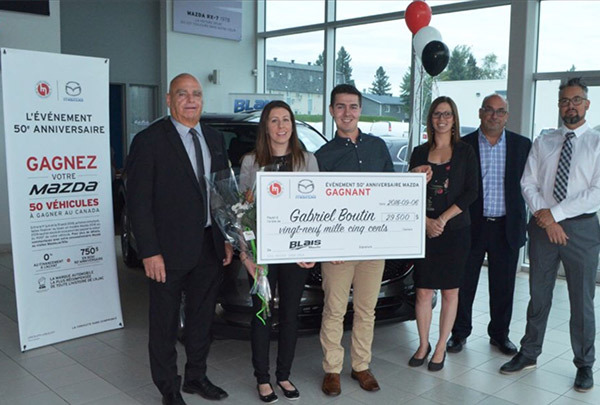 Mr. Boutin hopes to make a smart investment with the money he has won through Mazda’s Win Your Mazda contest. Jennifer is a big fan of the Mazda brand. The 2018 CX-9 GS is her third Mazda vehicle. She is very impressed with the drive and handling of her CX-9. 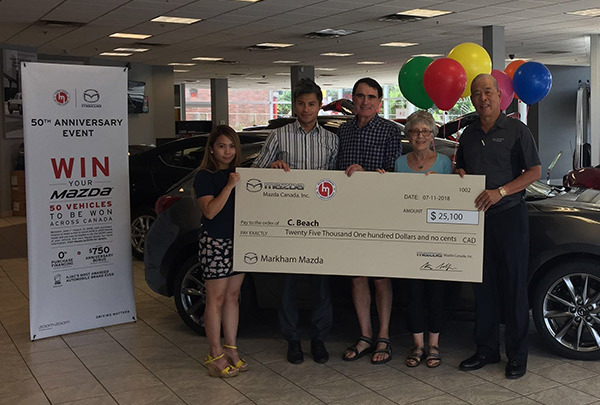 Jennifer had a wonderful experience at her local Clubhouse of Driving Passion, Achilles Mazda of Milton. Both the sales team and the owner of the dealership were very helpful and attentive to her needs. This is Jennifer’s second purchase at Achilles Mazda of Milton. She hopes to pay off her vehicle with the money she has won. Happy to have you as a loyal member of Mazda’s Clubhouse of Driving Passion, Jennifer. Congratulations! This is Kevin’s first new Mazda after having driven a pre-owned Mazda in the past. Kevin had a great experience with his previous vehicle and was very impressed with the new line-up of Mazda vehicles. He was particularly drawn to the Soul Red Crystal CX-5 and decided this would be a great birthday gift for his wife. We agree, Kevin! Wow! 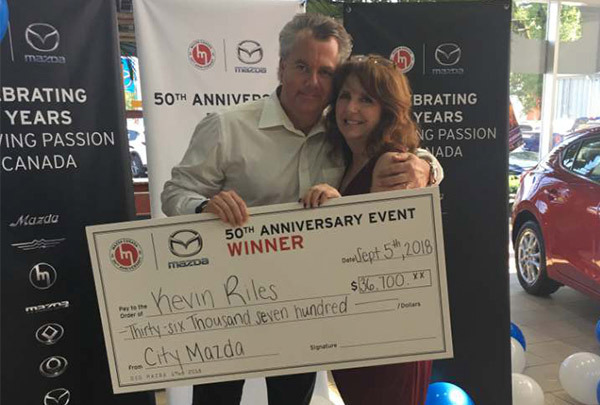 Kevin had the best experience he has ever had in a dealership when he visited his local Clubhouse of Driving Passion, City Mazda. 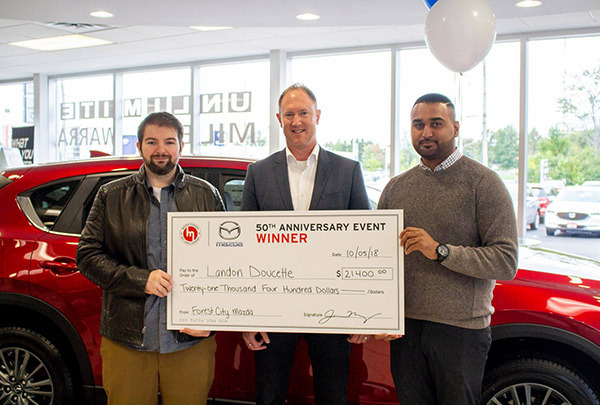 Mr. Riles was so impressed with the City Mazda team that he contacted Mazda’s corporate head office to share the details of his personal, once-in-a-lifetime experience. Kevin hopes to use the money he has won from Mazda’s Win Your Mazda contest to travel south with his wife. Congratulations, Kevin. We couldn’t be happier for you! This is Sean’s first Mazda. He chose the 2018 MAZDA3 as it was the vehicle with the most features and best ride for the value. Sean had a great experience at his local Clubhouse of Driving Passion, Mainway Mazda. He was provided with the information he was looking for and the team at Mainway Mazda listened carefully to his needs. Sean hopes to use the money he has won through the Win Your Mazda contest towards a down payment on a home for his family. Congratulations, Sean. Welcome to the Clubhouse of Driving Passion! 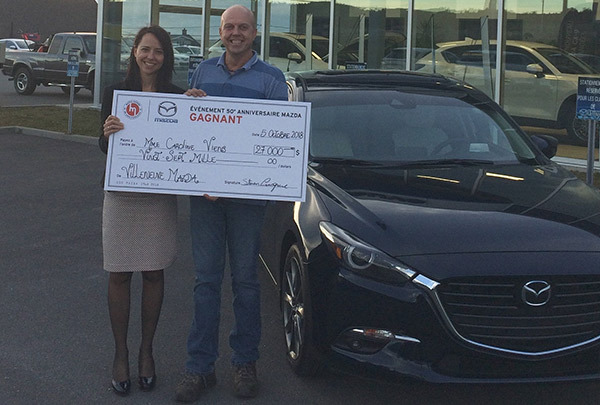 We love to hear the stories of our loyal Mazda fans, and Geneviève’s story is no exception! Having owned a Protegé and a MAZDA3, choosing another Mazda was only natural when it came time to purchase a new vehicle. Geneviève had a wonderful experience in her local Clubhouse of Driving Passion, Argus Mazda. The entire team was pleasant and inviting. She was so impressed with her previous MAZDA3 that she bought a brand new MAZDA3 GT. To her, nothing could beat the performance, allure and incredible dealership experience that Mazda had to offer. 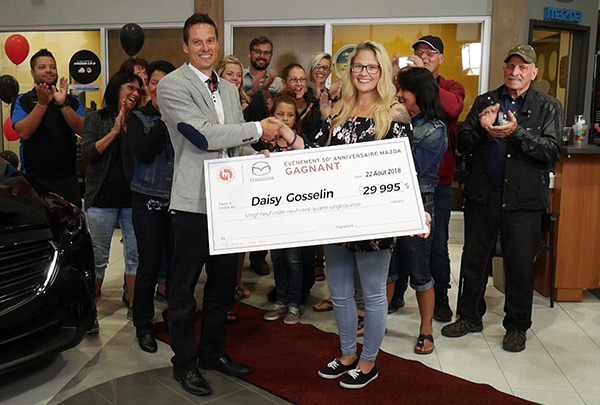 Geneviève plans to use most of the money she has won through the Win Your Mazda Contest to pay off a portion of her MAZDA3 and may just keep some of the money to treat herself to something special. When Maggie got behind the wheel of a 2018 CX-5, it was love at first drive! This is Maggie’s first Mazda. Her experience at her local Clubhouse of Driving Passion, Prima Mazda, was fantastic. She never felt pressured and felt the team was very patient and helpful, walking her through her purchase each step of the way. Maggie is looking forward to using the money towards home renovations as she has not had the opportunity to do so since she purchased her home. Congratulations, Maggie. Welcome to the Clubhouse of Driving Passion and good luck with your renovations! After seeing so many Mazda vehicles on the road and because so many of her friends were Mazda drivers and very happy with their vehicles, Israt decided to purchase a MAZDA3 Sport. Her experience with her local Clubhouse of Driving Passion, 401 Dixie Mazda, far exceeded her expectations. Everyone was very helpful in assisting her with her purchase. 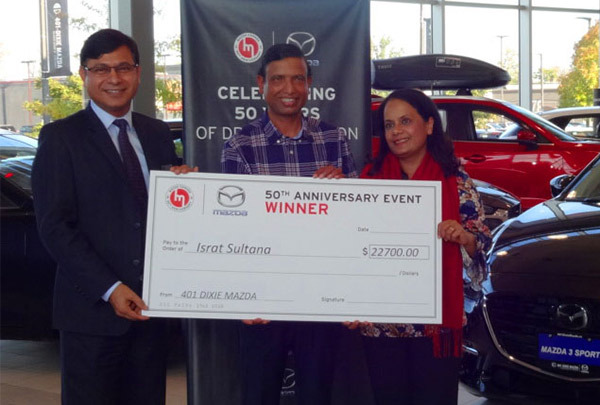 Israt is thrilled to have been selected as a winner in the Win Your Mazda contest and will be thinking long and hard about what to do with her winnings! Congratulations, Israt! Welcome to the Clubhouse of Driving Passion! This is Caroline’s second Mazda. Her first was incredibly reliable and her decision to stick with Mazda was an easy one! 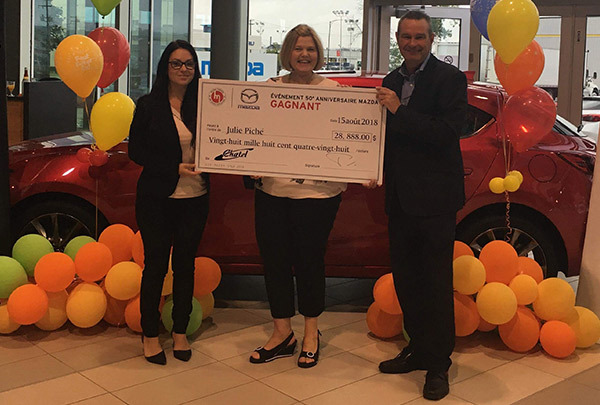 Caroline had an exceptional experience at her local Clubhouse of Driving Passion, Villeneuve Mazda. She plans on paying her vehicle off with the money she has won. Mr. De La Durantaye had heard about the Win Your Mazda contest online and thought he would participate. 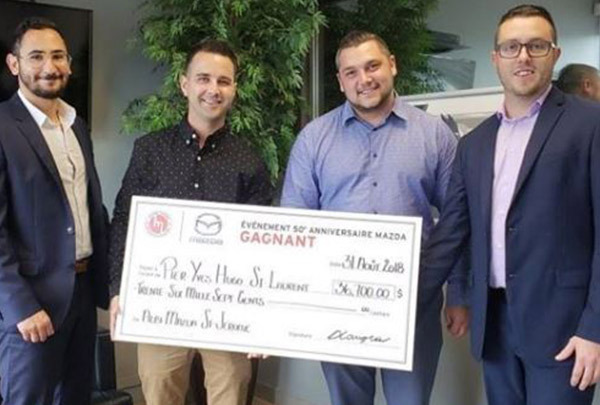 As parents to newborn twins, Ghyslain and his partner thought they could really use a new Mazda! Little did they know, they would be randomly drawn as winners! Mr. De La Durantaye had driven his father-in-law’s Mazda in the past and absolutely loved the way it handled. We look forward to welcoming Mr. De La Durantaye and his family to the Clubhouse of Driving Passion. Congratulations! This is Pascal’s second Mazda. Prior to purchasing a CX-3, Pascal owned a MAZDA3 with which he had a great experience. His girlfriend also had a Mazda Protégé for 15 years, so he was very impressed with the Mazda brand and its reliability. 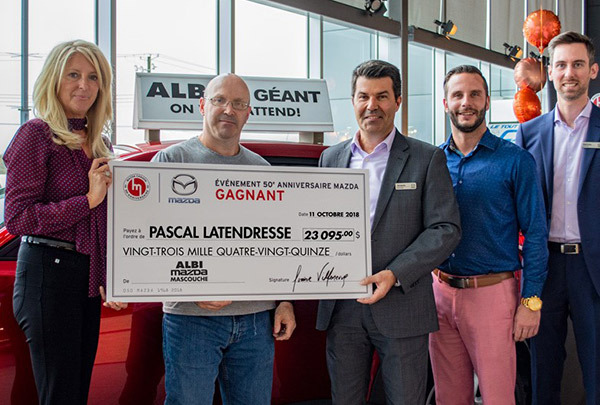 Pascal felt very comfortable and welcomed at his local Clubhouse of Driving Passion, Albi Le Géant Mazda. He felt that the dealership really took the time to listen to his needs and explained everything clearly. Pascal loves his new CX-3. Especially the heated seats and steering wheel, which will come in really handy in the winter months. He is not sure how he will use the money he has won yet, but he would like to treat his girlfriend to a nice romantic getaway! Landon is new to the Clubhouse of Driving Passion. After having read countless positive online reviews and seeing so many MAZDA3s in really great condition on the road, Landon went to visit his local dealership at Forest City Mazda. After experiencing excellent customer service and a streamlined and efficient process when purchasing his vehicle, Landon knew he had made the right decision in purchasing his MAZDA3 Sport. Mr. Doucette hopes to use the money he has won towards a long-term investment. All the best, Landon. Welcome to the Clubhouse of Driving Passion! When Emery was searching for a new vehicle, he took his time test driving several other competitive models. He was most impressed with Mazda’s test drive experience and his decision was clear the moment he got behind the wheel! 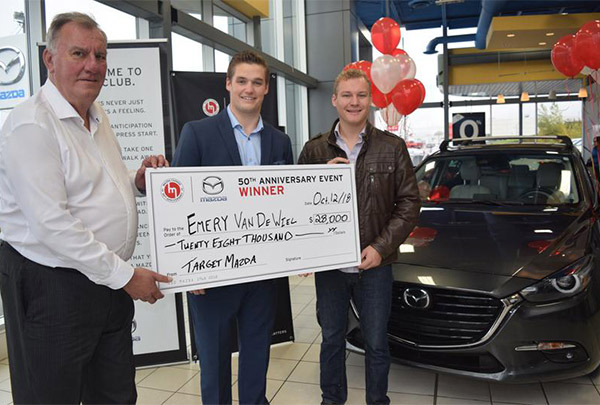 Emery had a great experience at his local Clubhouse of Driving Passion, Target Mazda. Of all the dealerships he had visited, Target Mazda provided him with the most positive experience. Emery plans on using the money he has won towards a down payment on a house, or towards his brand new vehicle. Congratulations, Emery. We are thrilled for you. Welcome to the Clubhouse of Driving Passion! Melanie had owned a Mazda for 8 years prior to purchasing her new MAZDA3 Sport GT. She was so impressed with the quality of her previous Mazda that she purchased another! As a real estate agent, Melanie spends a lot of her time on the road. With fuel efficiency, safety and reliability being of the utmost importance to her, she knew Mazda was the right choice. Melanie had an incredible experience at her local Clubhouse of Driving Passion, Sundance Mazda. She was very impressed with everyone she interacted with. From the sales team to the finance and service teams, she received top-notch service! 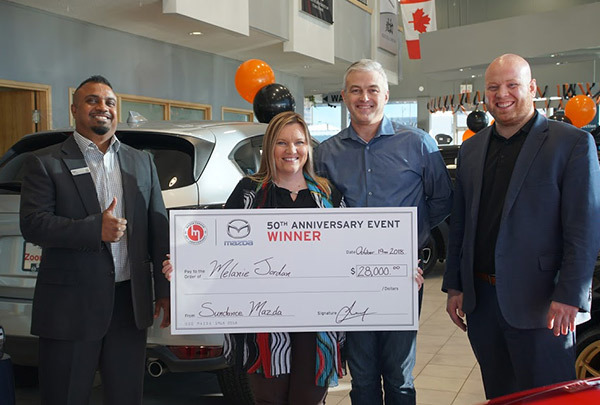 Melanie is truly happy to have won this money thanks to the Win Your Mazda contest and she hopes to put it towards a down payment on a home. We couldn’t be happier for you, Melanie! 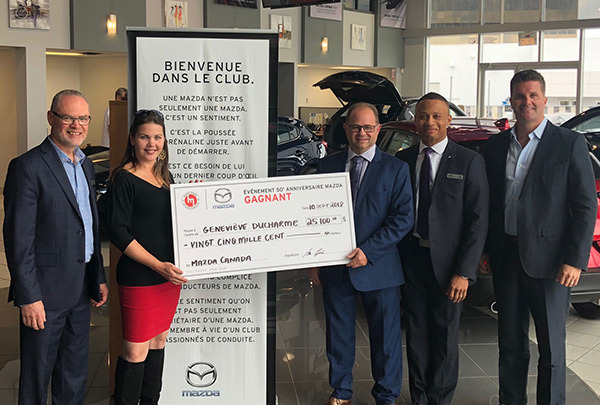 We are always thrilled to welcome a new customer to Mazda’s Clubhouse of Driving Passion and we couldn’t be happier to have Pier-Yves Hugo St-Laurent on board! After doing a significant amount of research online, Mr. St-Laurent chose the Mazda CX-5 GT. 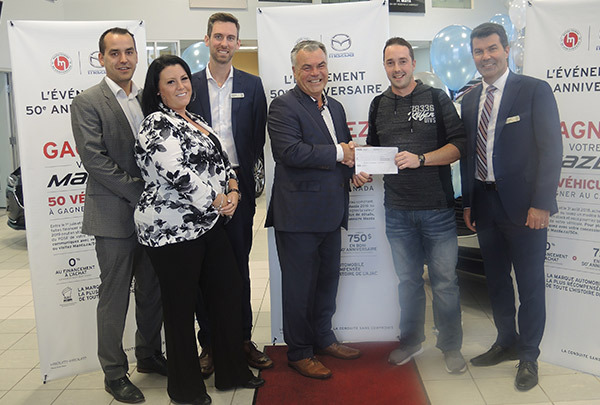 He visited multiple dealerships but found his Clubhouse of Driving Passion at Albi Mazda St-Jerome after having received exceptional service. From the salesman to the receptionist, he found everyone to be very charismatic and helpful. Mr. St-Laurent loves the technology and premium features that come standard in his CX-5 GT. He is very impressed by the touchscreen and overall feeling of luxury that Mazda offers. He is able to tow his RV, all while driving a great-looking vehicle that is fuel efficient and has an incredible warranty, Mazda Unlimited. 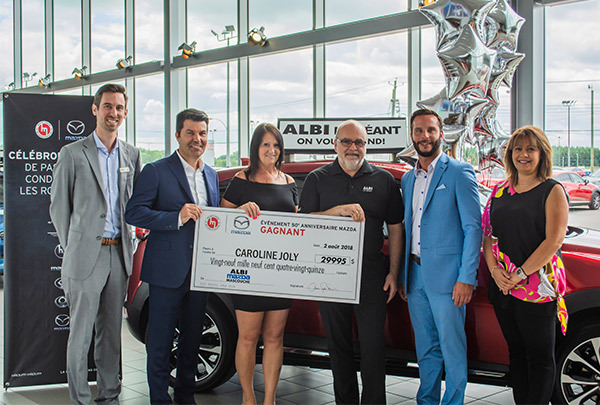 Mr. St-Laurent plans on purchasing a new home soon and hopes to use the money he has won through Win Your Mazda towards a down payment or to pay off his new CX-5. Congratulations and welcome to the Clubhouse of Driving Passion!